please contact us, ideally with a published obituary. Clark, Doris (née Ashby). August, 1965. Doris Clark (née Ashby), in school 1920-1926, was killed in a motor accident on August 29th. Mrs. Clark trained as a teacher before marrying. She was an active member of the Ely High School Old Girls' Association and served on the Committee. Always a keen worker for the Girl Guide movement, she had been appointed Divisional Commissioner. She was an active social worker; she took part in the Meals on Wheels Movement and was a member of the Friends of Ely Cathedral. She is greatly missed by those who knew her and worked beside her. Baird, Miss BR was appointed as French Mistress 1915 and when she retired in 1946 she had for seventeen years been Second Mistress. In retirement she played a key role in the Old Girls Association. She died on 30th November 1972 at her home in Bury St Edmunds. Brook, Pamela (EHS Staff). Pamela Brook was another stalwart of Ely High School, died in Woking in October 2007. Ely was always an important place for her and she returned several times a year for over 40 years to renew friendships. Early last year she told me how pleased she was when her former pupils recognised her and stopped to speak. She too came to our Reunions in 2000 and 2005. She came to teach English at Ely High School in 1951 and stayed for 12 years before moving to a post at Woking Grammar School and later Woking Sixth Form Centre. Always immaculate in appearance she commanded respect through the high standard of teaching that she brought to the school and the ability to control a large number of girls with just a look! As well as demanding perfection in grammar she opened up the world of classic novels, poetry and the works of William Shakespeare and coaxed many pupils into dramatic performances on stage. Miss Brook also masterminded the removal of books from Bedford House to the new buildings in Downham Road as part of operation "shopping bag." She remained interested in Ely after her move, visiting regularly and maintaining contact with many of her former pupils. She also travelled and enjoyed theatre visits to London and Stratford on Avon and it is fitting that her ashes will be taken to Stratford: "parting is such sweet sorrow" - Romeo and Juliet. Wallace, Shirley (née Brown) started at our school in 1953 and attended several Reunions although incapacitated by multiple sclerosis. She passed away in December 2007. Burling, Anne (née Cates), funeral at West Suffolk Crematorium on 30th March 2015. Age 71. Born in Wood Ditton. Worked for Roes the Jewellers and Pyes in Newmarket. Wrote magazine articles. Her stories for children were used by the BBC's Listen with Mother. Later worked at the Laureate and Fairstead House Schools. Brown Owl with 1st Newmarket Bownies for ten years and developed greater access for children with learning difficulties. Following the publication of her first book she opened a bookshop in Sun Lane, Newmarket, moving on to shop management at another bookshop and a whole food shop; had other retail jobs until retirement. Loved horse racing and owned a share in a racehorse. She leaves her husband Victor, daughter Lucy, son Robert and three grandchildren. Via Frank Haslam from the Newmarket Journal, 9 April 2015. Miss Cooper taught music, both class singing and piano, in this School for many years, from 1925 until her retirement in 1949, after which she continued to take private pupils. She always took a great interest in the girls she taught, and in everything in the musical world. Many girls have cause for gratitude for the careful, individual tuition they received from her, and for her affection for them. She will be long remembered by all those who were her pupils and by those citizens of Ely who met her in connection with musical events. Miss Tilly: During the early part of this year the school lost a former member of Staff and a devoted friend, in the passing of Miss FA Cooper. During the many years when she taught here she became endeared to many girls and especially to those who were her private pupils. We who knew her so well, were delighted that she was able to be one of the guests of honour at the Old Girls' Jubilee Luncheon last year. She will be sadly missed by many pupils and friends. Doreen (née Cox): on 5 Jan 2015 Christine Fuller reported that she had been informed of Doreen's death over the festive period. Doreen had attended reunions for some years. Cross, Pauline d 15 Sep 10: born in Little Downham, would have entered EHS about 1947. Covey-Crump (LRAM), Angela Mary Kingsley: EHS Staff: died at Addenbrooke's Hospital in Cambridge on December 14 2005, aged 93. Angela who lived in Ely but was originally from Hampshire, was a teacher by profession. Her last two posts being at Ely High School and the City Of Ely College where she taught maths. [She joined the staff of EHS in the 1950s]. Angela was the daughter of the late Captain Ayre so grew up with a naval background. After her retirement, she helped her husband Leo, to whom she was married for 60 years, with the WRVS Meals On Wheels service. Angela leaves two children, Peter and Anne and three grandchildren, Anthony, Elizabeth and Sarah. The funeral took place at Ely Cathedral on December 28 2005. Donations were made to the East Anglian Air Ambulance: source Eastern Daily Press January 6, 2006. Dewar, Hilary (EHS Staff: Music), died since 2000: can anyone add details? Hardman, Pamela (née Easy): on 5 Jan 2015 Christine Fuller reported that she had been informed of Pamela's death over the festive period. Pamela had attended reunions for some years. Evershed, Mollie was drowned at sea in 1944. She was a nursing sister aboard a hospital ship full of wounded men and when an explosion occurred and the ship began to sink, Mollie together with the Matron succeeded in carrying up to the deck about seventy stretcher cases. Finally however, Mollie was trapped below deck and went down with the ship [HMHS Amsterdam] off Juno Beach, Normandy on 7th August 1944. Mollie is commemorated on the 1939-45 section of Soham's Town War Memorial. All Old Girls who were contemporaries of Mollie Evershed will hear with great regret of her death at sea on 7th August 1944. Mollie was at the school in the years 1928-32. Afterwards she trained as a nurse at the Norfolk and Norwich Hospital. In 1943 she volunteered for the Queen Alexandra Imperial Nursing Service. In August of last year, she was on a hospital ship full of wounded men. An explosion occurred and the ship began to sink but Mollie and the Matron succeeded in carrying up to the deck about seventy stretcher cases. Finally however, Mollie was trapped below deck and she went down with the ship. Practical, steady, and reliable, Mollie was always eager to help in any way. She was energetic, lively, full of fun and friendly and popular with everyone in the school, both Staff and girls. We, who knew her and remember her, were grieved to hear of the loss of a young life, so full of promise, but we are also very conscious and proud of the heroism, devotion and sacrifice which she showed in that hour of her supreme testing. We offer her parents, Flight-Sergeant R Evershed and Mrs Evershed, in their irreparable loss, the sympathy of all the members, past and present, of Ely High School. Her story is featured on the British Normandy Memorial website. There is no permanent British Memorial to the 22,442 men (and two women) who gave their lives during the D-Day landings and the Battle of Normandy. It is narrated by our Annual Luncheon organiser, Christine Fuller - please click here. We suggest you first read the page and then go back up the page to play the movie clip. Godden, June Lilian: d February 20th, 1952 , aged 18 years. June Godden attended School from 1944 to 1950; after leaving School she went on to the Mackenzie School of Drama to continue her studies in elocution and drama. Her talent often added distinction to our School performances with her beautifully finished work, her clear voice, and the feelings which she could most eloquently express. We shall always remember her great promise which she showed, for she was loved among us for her great gifts and the excellence she had reached. Mitcherson, Elsie (née Green) d May 2014: Elsie was from Wilburton. She met Jack Mitcherson when he was serving at Mepal with the RAAF and emigrated to Autralia to marry him in 1948, almost 10 years to the day after she was in the 1938 school photo: via her daughter Jan Richards. Brooker, Monica (née Hamence): died January 2011. Shown on the 1938 School Photo. Lived in Sutton. When she left school she worked for Bonnett’s bakery and restaurant in Ely which was owned by her Aunt and Uncle. She died in 2011.Via her daughter Marlene (now Mrs Corke) who was also at EHS, as was Monica's aunt Mabel Hamence who was in the 1913 entry. Carter, Janet (née Harmston): died suddenly at home in Ely on Monday, January 10th, 2011, aged 74 years. Loving mum to Mark and Niki, dearest sister of Sue and brother-in-law Barry. Funeral service at St Mary's Church, Ely, on Wednesday, January 26th, 2011, at 1.30pm, followed by interment in Ely Cemetery. Family flowers only but donations for The Royal British Legion, Ely Branch, may be left at the service or sent to Ely Funeral Service Limited, Tower Road, Ely. from the Eastern Daily Press Thursday, May 31, 2007: Lorna Delanoy died at the West Suffolk Hospital on May 19th 2007. Her funeral service will be held at Norton Parish Church on Wednesday June 6th at 2pm. During the 1950s she was a popular PE and games mistress at the Ely High School for Girls, then at Bedford House in St. Mary's Street. She helped design the gymnasium for the new High School at Downham Road which is now part of the City of Ely College complex. In 1956 she married Don Delanoy and lived at Stapleford, later at Foxton, in South Cambridgeshire, where she became a parish councillor, school governor and chair of the Gardening Club. Moving to Suffolk 21 years ago, she continued her interest in church work, gardening and British Legion Poppy Day collections even though for the past three and a half years she had been confined to a wheel chair.News of Ely High Old Girls was always welcome and she attended the centenary celebrations both at the cathedral and at Brook House two years ago. As well as her husband, she leaves brothers and sisters-in- law, John and Barbara of Ely, and Mike and Lorna of Mepal. With the passing of Mrs CM Taylor on November 22nd 1967, the School lost one of its earliest pupils at the same time one of its nearest and dearest friends. For some forty years Mabel was the Honorary Secretary of the old Girls' Association until her retirement in 1966. The devoted service which she gave through all these years and her intense and unfailing interest in the Association and in the School were of the rarest. Her tasks included, not alone the keeping of records of the membership, but arrangements for meetings and Reunions, and what was perhaps more demanding, the collection of subscriptions. All these were always done with an enthusiasm and faithfulness which never wavered. Her wide knowledge of old Girls and their families going back as it did to the very beginning of the school, together with her loving interest, were of incalculable help to the Association, and instrumental in keeping it on a firm foundation. When Mabel resigned from the office of secretary, and this was only when ill-health compelled her to do so, she left the Association in a very flourishing condition with a keen and growing membership. Such a service as she rendered for us all has an effect on the School as a whole, because a strong old Girls' Association is an asset to school life and helps to keep continuity between past and present members. Mabel has known the early beginning of the School and as a pupil of the first Headmistress, Miss EE Fletcher who set its high tone and aspirations she stood for I think, especially faithfulness, selflessness, sincerity and devotion, the school's debt and that of the old Girls' Association can never be calculated. Her service was one of those precious things, gratitude for which is beyond the power of word to express. For myself I was very fond of her, knowing how much she loved the School. I am grateful that the School was privileged to have her as a pupil. She was one who never severed her connection with it, but went on to give us all such wonderful service for so long. Hers was a love and enthusiasm which never changed. Seldom indeed can a Society enjoy the service of so faithful and devoted a secretary as our Old Girls' Association was privileged for many years to have in Mrs Taylor. A pupil of the school herself during its early years Mrs Taylor became also, in course of time, mother and grandmother of pupils - both Susan and Brigid Riley were Head Girls - thus having, I think, a unique link with the actual school, as well as being Old Girls' Secretary. She attended most school functions, keeping closely in touch with its development and achievements, interested even in such details as changes in uniform. She welcomed, for instance, the introduction of the straw boater as a possible summer hat, thinking it gave greater distinction to the girls' appearance. Her interest did not cease when ill-health obliged her to give up office. She always welcomed news of the Association and its members, and remembered it. Some long time after her retirement I gave her, as I thought, interesting news of an Old Girl's family. Immediately she raised her head and said "Yes, you told me that last time you came". I had forgotten - but she hadn't. Such an incident speaks for itself. And so, with her passing, the School has lost one of its most devoted members, and all of us a dear friend, whose warm, affectionate interest we shall long cherish in grateful memory. Taylor, Ann (née Humberstone): Died on 19 May 2012 in Norfolk. Ann was one of many girls who travelled daily by train to EHS - she and Christine Fuller were in the same class. Brogan, Eleonore Mary, (née Jobson), died in the village of Aldreth shortly before her 94th birthday on 7th January 2010 after a short battle with cancer. She attended Ely High School between 1926 and 1934 - she was very proud of her time there and would tell her grandchildren about the good times she had there, right up until her death. They understood that she took an active part in school life. She used to catch the train every day from the village of Fordham: via her son Mike. Crofts, Freda Elsie, (née Kerridge): Freda, who was born on 4th October 1922, died peacefully in her sleep on Sunday 30th September 2012. She was born at Bush Farm, Littleport, Cambridgeshire, attending EHS during the pre-war years. During WWII she was a childrens' nurse, a role which enabled her to travel to Persia after the war. She married Sam Crofts in 1950 and subsequently moved to Haddenham where she had three children: Richard, Ian (both SGS boys), and Alison (who attended EHS). She became involved in many activities within the village. After Sam died in 1986 she started to travel to various parts of the world, an adventerous trait she passed on to her grand-daughter. She will be missed by her children, grand-children, great grand-daughter and her many friends: via her son Richard. Labdon, Jennifer. November, 1965. Jennifer Labdon, in school 1954-1958, was tragically killed in a car crash in Israel. After leaving Ely High School, Jennifer took a secretarial course at Cambridge Technical College before working for a year in the Cambridge University Appointments Board. She then entered Stockwell Teachers' Training College, and after qualifying taught for a year in Kent. Two years ago she joined the staff of a primary school at Stapleford, near Cambridge. When the accident occurred she was touring in Israel doing social work in the hope of finding employment abroad for some length of time. Jennifer was greatly loved by all who knew her, both by staff and girls. She had charming manners, an affectionate disposition, keen enthusiasm in all spheres, and much to give to the school community. She served as Deputy Head Girl in her last year at school. We who knew her have lost a dearly loved friend. Hullyer, Sheila Joan (née Lister), 1947 entry, who passed away after a short illness on 23rd July, 2012. She attended our 2011 reunion. Czarnobaj, Pamela Joyce (née Martin) of Ely passed away peacefully at Arthur Rank Hospice on Thursday 7th January 2016 aged 78 years. Dearly loved mum to Andrew, Anthony, Liza, Richard and James and nanna to Joseph, Arianne, Shannon and Ellis. Funeral Service was at St Mary’s Church, Ely on Friday 29th January 2016 at 11am followed by interment in Ely Cemetery. Alder, Brenda (neé Mason) who attended Ely High School for Girls (believed from 1952 to 1957) died on 9th July 2017, aged 75, writes her husband Peter Alder. Brenda was born on 4th December 1941 in Isleham and lived there with her parents until she married me on 2nd April, 1977. She gave birth to twins on 6th June 1978 - a son Craig and a daughter Samantha. When she left school she initially worked for Heffers in Cambridge, before moving on to secretarial work with British Rail in Cambridge, Ernest Webb & Co in Exning, Magnetic Devices in Newmarket and then with the Newmarket Urban District Council. When I met her she was the Chief Financial Office's Secretary at Forest Heath District Council. Following her return to work as our children started school she went on to be Personal Assistant to the National Sales and Marketing Director for Schering-Plough Pharmaceuticals and ultimately the PA to the Journals Director at The Royal Society of Chemistry on the Science Park in Cambridge, retiring in 2001. She often talked about her time at Ely High School for Girls. Harper, Jeanne (née McCullagh) died on 16 December 2018 in Shropshire. Christine Fuller writes: The McCullagh family consisted of two boys and six girls. Five of the girls attended EHS: Eileen, Norah, Jeanne, Elsie and Mary. Their lives were spent in Ely as a close family unit and even when some of them moved away when they married they still retained that special family closeness. Eileen passed away in 2009, in Ely. Jeanne was born in 1940, became a teacher and although she had suffered ill health in recent years she was well enough to join her three remaining sisters for the 2018 EHS reunion. She was the widow of Max Harper and continued to live in the family home and is survived by her three sons. She was a devoted mother, grandmother and great grandmother and will be sorely missed by her large family. I have always held the McCullaghs in very high esteem as each member is very quiet, kind, caring and concerned in every circumstance. I have known them throughout my life. Truly a lovely person. Dr Fay B Newstead, general practitioner, died at her home in Ely on 27 July. Fay Barbara Newstead was born in Ely, Cambridgeshire, and educated at the local high school and then at King's School, Ely. After graduating in medicine at St Bartholomew's Hospital, London, in 1963 she worked at Southend General Hospital in anaesthetics. In 1967 she joined the Royal Air Force and was stationed at Ely, Uxbridge, and Holton, after which she left to work in anaesthetics and casualty at the Norfolk and Norwich Hospital at Norwich. She trained for general practice at Attleborough, Norfolk, eventually working in Docking and the surrounding villages. In 1975 she returned to her home city and worked as a general practitioner at Littleport. Fay Newstead was well loved for her kindness and dedication to her patients, and she faced her terminal illness with great courage and dignity. MHD. Hopkin (née Nunn) Alma May of Soham, after a short illness in Addenbrooke’s Hospital on Friday 11th March 2016 aged 84 years. Loving wife to Ken, wonderful mum, nan and great nan. Celebration Service at Soham Methodist Church on Saturday 2nd April 2016 at 10.30am. All Welcome. Donations, if desired, for East Anglian Children’s Hospice – Milton may be left at the service or sent to Ely Funeral Service, 4 Tower Road, Ely, Cambs CB7 4HW Tel: 01353 666566. Those of us who belong to the first quarter century of Ely High School hold Miss Parkes in dear and most affectionate remembrance. No one could fail to recognize and appreciate the loyal, loving and selfless devotion with which she served the school. In herself quiet and unassuming but with firmness of principle and strength of character which never wavered, she exercized a strong and lasting influence. In all her ways she showed what it meant to be a Christian gentlewoman. We honour her memory. from the 1967 Ely High School magazine. Sculthorpe, Phyllis May (née Peters), of Mepal, who passed away peacefully in Addenbrookes Hospital on 22nd April 2013, aged 83. In the mid 1990s it was the Sculthorpe sisters-in-law, Phyllis and Olive née Blinch who decided to get in touch with their former school mates and organised Reunions held at the Soham bypass motel; these formed the basis of the group that meets today in the Annual Reunions held each May in Ely. The numbers attending grow year on year and we meet in an informal, happy and relaxed atmosphere and keep the memory of our school alive. Cooper, Ivy: Mrs Phyllis Ivy Mildred Cooper (née Pinion), of Haddenham, formerly of Wilburton and Sutton St Edmund, died at Addenbrookes Hospital, Cambridge, on May 20 2007, aged 94. Born at Newborough, Peterborough, she was one of seven children. The family moved to Wilburton, where Phyllis - or Ivy as she was known - was educated at the village school and then Ely High School. Her life as an educationalist began at Leverington village school before completing her teacher training at Norwich College. Posts at Wisbech Queen's School and the Payne School, Parson Drove, followed. After marriage to John Ellis (Jack) Cooper and the birth of her two eldest children she returned to teaching at the outbreak of World War Two and was on the staff at Silver Street and Newnham Street Schools in Ely. During that time the London Jewish Free School was evacuated to these schools. She worked with the Civil Defence and the WVS. Twice a week trains arrived from London to bring evacuees, who were then housed in the Ely area. Other evenings were spent teaching craft skills to injured airmen at the RAF hospital. Her next move was to Lincolnshire as the head of Sutton St Edmund Primary School where she remained for the next 30 years until its closure when she transferred to Sutton St James School, remaining there until her retirement. Her commitment to the church saw her serve as a churchwarden and a member of the Diocesan Committee. Oxbury, Susan (née Porter) passed away on Wednesday, 2nd March, 2016 in Addenbrookes Hospital, aged 75 years. A Haddenham girl, she attended EHS from 1951-57. Sue married Colin Oxbury from Papworth Everard in April 1964, and they lived most of their married life in Godmanchester, Huntingdon. She suffered ill health for a number of years but was a fighter, never giving up, always happy and never complaining. She will be missed very much by her husband, Colin, her sister, Jean, who also attended EHS and Jean's family who she was very fond of, and her many friends: via Pat Merry (née Markwell), EHS 1951-57, an Alpha girl and Christine Fuller (née Bell). Barker, Alocha (née Power) of Pymoor, who came from Black Horse Drove when a pupil at EHS, passed peacefully away on Saturday 13th December 2014, aged 67 years. A dearly loved wife, mother and grandmother. Her funeral service was at St Leonard's Church, Little Downham on Friday 2nd January 2015, followed by committal at Fenland Crematorium. Raine, Sylvia who passed away in her second term at school on 26th March 1954: Sylvia came to the school as a new girl in September, 1953, and had not been with us quite two terms, but in that short time during which she was with us she showed herself to us all as a girl whose character was of the highest and the best. She had enthusiasm too, for her lessons, and was working hard. She would indeed have been a credit to the school in the years to come. Our sympathy goes out to her parents and brother in their tragic loss. Ellis, May (née Russell) Anne Blake writes: My aunt died on 21st October 2014. May was born in 1919 and was a pupil at EHS in the 1930s. After leaving school she trained as a nurse. During the war she served in the Queen Alexandra Imperial Nursing Service in Africa and Greece. Brown, Christine (née Skeels): of Barton, beloved wife of Mike, much loved mum of Teresa, Julie and Steven, mother-in-law of Brian, Paul and Jude, loving nanna of Sam, Arthur, Harriet and Beth, passed peacefully to rest on Wednesday, 11th December, 2013. Funeral service and committal, 11.15am, at Cambridge City Crematorium, West Chapel, on Thursday, 2nd January, 2014. Cambridge News from Dec. 17 to Dec. 19, 2013, via Christine Fuller who adds that Christine Brown had attended many of the Reunions. Smith, Helen: d 1st September 2018 in University College Hospital, London, after a short illness. Her three cousins were with her. Christine Fuller says "Helen will be remembered as a serious and studious girl at school and as a valued colleague in her career". Her brother Dr Edward GR Smith was in the 1956 entry at Soham Grammar School. He died of cancer in 2013. Helen was also a good friend of the late Jackie Sotheran (née Bidwell). Via Christine Fuller. Stanyer, Helen (EHS Staff, Geography) 1934-1975: Helen Stanyer was my mentor and my friend who collapsed and died when she was Careers Tutor at the City of Ely College. She was the second of my three teachers of Geography all of whom fired my enthusiasm in that subject - writes Christine Fuller (Bell). Taylor, Sylvia lost her long battle with myeloma on 22 April 2009: via Heather Smith (Holliday). Jefferson, Alma (née Thorby) passed away on 6 June 2014. She had been a regular attendee at the Reunions over the years but was too unwell to attend this year. She had lived in Littleport all her life. The Fenprobe (talking news service for E Cambs) website noted that Alma "joined them as a reader with the Pilgrim Group in the late 1990s and remained as a valued and consistent member of Bill's group until 2012, when she resigned because of failing health. She will be remembered with affection for her humour and goodwill. Our thoughts are with Gordon and the family. The funeral is on Tuesday, 24 June at the Salvation Army, City Road, Littleport, Ely CB6 1NG at 2 pm." Thulborn, Doreen, d March 8th, 1952, aged 23 years. Doreen Thulborn attended School from 1939 to 1945. She was a girl of quiet and loveable disposition, not one to push herself forward, but always pleasant, always to be relied on. Her contribution to the community of School was in her fine character and in her steadiness. She had taken up nursing as a career: her passing means a great loss to the profession. Tyndall, Arthur : one of the original entrants to Ely High School in May 1905 he was to fall at Passchendaele just twelve years later. "Given in Memory of Arthur George Tyndall, a pupil at Ely High School 1905-1909; Lieutenant in 2nd Battalion, Rifle Brigade; Killed in Action at Passchendaele, November 18th 1917." "Son of George Herbert and Annie Tyndall, of Minster Cottage, Ely. Formerly Cambridge University OTC." It says he was a 2nd Lt in A Coy, 2nd Bn, Rifle Brigade. He has no known grave and is named on the Tyne Cot Memorial. A dedication by someone who fought alongside him: "THE RAILWAY MAGAZINE BOUND VOLUME VI JANUARY to JUNE 1900". ... The book was purchased new, in London, by my Grandfather. ... My grandfather placed a printed "In Memoriam" sheet on the inside cover of the book, dedicating it to Second Lieutenant Arthur George Tyndall, who was killed in action at Passchendale, Belgium on 18 November 1917, while fighting next to him." 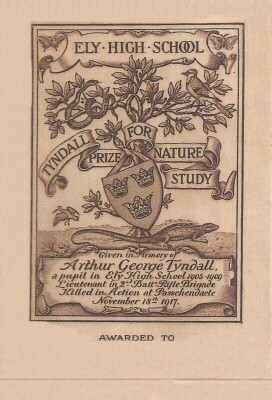 Only child of George Herbert Tyndall, of Minster Cottage, Ely, Bookseller, by his wife, Annie, dau. of George (and Rosina) Wemling, of Harston. Born Ely, co. Cambridge, 16th May, 1898; educated Ely High School; Lynfield, Hunstanton and Fitzwilliam Hall, Cambridge, where he was a member of the OTC; was a pupil of the County Surveyor, received a commission, and was gazetted 2nd Lieut. The Rifle Brigade 18th Sept, 1917. Served with The Expeditionary Force in France and Flanders from 18th Oct following, and was killed in action at Passchendaele 18th Nov. of the same year. His Commanding Officer Lieut-Col Brand wrote: " He had only been with us a short time, but had shown promise of doing excellent work ..... I am very sorry that a promising young officers life should have been cut short." Verini, Miss EM: Headmistress 1929-36: aged 93, died 7 July, 1987. Mockridge, Patricia (née Warwick) (EHS staff, English 1954-58). Pat's daughter Rachel Clayton writes: Ely was Pat Warwick’s first teaching job after graduating from Royal Holloway College and King’s College with a BA Dip Ed in English. She joined the staff in 1954 at the same time as Diane Heath (English), Bridget Pearson (now Lay: Geography & RE) and Beryl Wagge (now Courtney: PE). Patricia remained in touch with all these ladies all her life, until Di’s death a few years ago. The headmistress at the time was Bertha Tilly and head of English was Pam Brook who enthusiastically produced Shakespeare plays, musicals and operettas, in which Patricia was involved. This not only encompassed her interest in literature but also her passion for choral music which lasted throughout her life. She shared accommodation with a Mrs Bush. Stella Cork joined the staff in September 1956 to teach PE and they remained friends until Patricia’s death. The whole school moved to brand new premises at the end of the summer term 1957 and Patricia left in July 1958. Stella remembers them both belonging to the Cambridge Choral Society, performing in King’s College and Linton Village College. They were transported to rehearsals at breakneck speed by Walter Constable who lived at Wardy Hill. He later went to London, played the organ, got a scholarship to RSCM and became John Constable, the well-known pianist and accompanist. At weekends Patricia would sail at Ely Sailing Club as well as returning home to sail in Norfolk. After leaving EHS in 1958 she moved to teach in London where she met her husband Philip. They moved to Kent where she had two teaching jobs whilst they brought up a family and then returned to her beloved Norfolk where she remained until her death on 10 March 2016. She was a keen sailor and singer all her life but she had many other hobbies and interests, naturally including literature. She leaves a daughter in Norfolk and a son and two grandsons in the USA. Patricia attended the staff reunion in 1995 at Pam Brook’s house at Woking. Editor: Together with her husband Philip Patricia wrote books on weathervanes. She died on 10th March 2016 aged 83. Her memorial service took place on Tuesday 22 March 2016 at St Helen’s Church, Ranworth, Norwich. Rayner, Rita (née Wayman) 1907-2007: Rita was a district nurse in the Sutton, Mepal area for many years and may well have delivered many of Old Girls in the course of her duties. As the oldest former pupil attending the 2005 Reunion, she had the honour of cutting the celebratory cake with Pip Unwin.